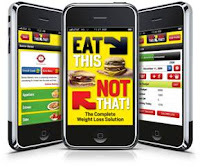 Men’s Health, the largest men’s lifestyle magazine brand in the world, has released its “Eat This, Not That!” application for the iPhone and iPod Touch at the Apple App Store for $4.99. Based on the best-selling “Eat This, Not That!” book series, by David Zinczenko, with Matt Goulding, now in its fifth edition, the application puts thousands of healthy food options at user’s fingertips, with tried and true food swaps at restaurants and the supermarket proven to save users thousands of unwanted calories. “It’s the first weight-loss application with actual editorial content, putting the power of carefully culled nutritional knowledge at users’ fingertips when it matters most—at the point of sale. Not only will the content be constantly updated from the “Eat This, Not That!” website and the pages of the bestselling book series, but the no-diet food swaps should stand shoulders above other weight-loss apps with only basic platforms,” said Men's Health Editor-in-Chief, and Women’s Health Editorial Director David Zinczenko. In addition to automatically updated food swaps on over 10,000 grocery items and 13,000 restaurant menu items, the application also includes a calorie logger that lets users track their daily and weekly caloric intake, as well as how many calories they have worked off. The application combines this information to provide users with a percentage of allotted calories consumed.